Prosperity Consulting: Can Anyone be an Entrepreneur? Just like anything else in life, you have to give it your proverbial "all" in order to accomplish anything. Often, you must step out of your comfort zone, follow your heart, and dive head first into what you're passionate about. 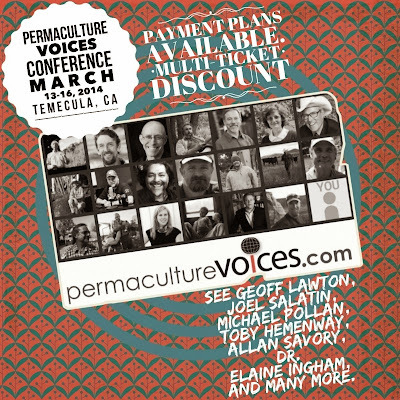 In March, I have the opportunity to speak at the Permaculture Voices Conference held in Temecula, California. I'm really looking forward to this event where I know a variety of perspectives on agricultural production will be shared. It's shaping up to be a unique platform- also speaking will be well-known writer, Michael Pollan. Speakers will come to that meeting with view points that will both compliment and contrast and I believe it will be a powerful opportunity to further the discourse about food. Click on the photo below to listen in on my podcast with Permaculture Voices' event manager, Diego Footer. We talk about entrepreneurship, and a little about how I came to be where I am today, in particular about the way I encourage would-be entrepreneurs to pursue their goals in business. Speaking of business, if learning about grant strategy or if better understanding the REAP grant in particular fits your business development needs, sign up for one of our two classes! On October 24 & October 25 we will be teaching YOU some of the basics and some of our special secrets! Taken right from my forthcoming book, Find Grant Funding Now! we'll cover all the steps to winning grants. Also, if you haven't already, you should sign up for one of my two remaining grant courses I'm offering October 24 and 25, 2013 in Indianapolis. Check out my website: www.prosperityconsutlingsba.com to learn all the details & Register!